I never considered myself as a good Travian player. Travian for me is but to while away some free time. But through the years of playing Travian, on different local and international servers, I believe my playing style improved through time. Not necessarily being in the top ten defenders or attackers, much else as a raider, but rather in terms of strategy and in some ways in diplomacy. Playing Travian the first time till end game in the Philippine Server 3 proved to be as difficult as it was for a newbie! I only managed to settle four  Villages and never been able to create a Senator to conquer another Village. After that game was over, with several lessons learned on what buildings to prioritize and what to do with the Travian account on the first three days with Beginner’s Protection, I believe I am getting the hang of this game and understand something or even more about the playing strategy. 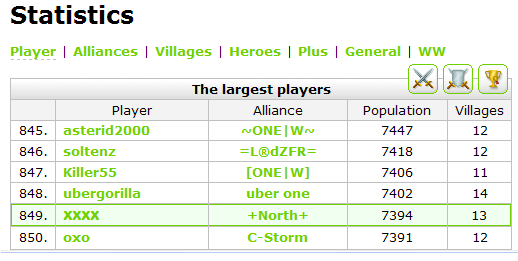 For Travian 3.6 in Server 10 [com10], I was even surprised to see that in terms of Village population and Hero’s level, my Travian account belonged to the top 1000 players. Among all the Roman players, my account was somewhere at 305th place. All these happened even with the constant attacks in my previous Capital, 0.Good Friday Curse, from my big-time neighbor, the Hero managed to level up! One of my sitters mocked my incessant revival of my Hero during the barrage of catapult attacks from my big-time Travian Plus/Gold neighbor. The sitter said it was useless doing so during these times because the Hero would only be massacred. The Hero obviously died but it also gained experience, was my usual reply. Apparently, the Hero did and also managed to kill some aggressors in the process. Furthermore, in terms of attacking and defending, my Travian account was among the top 1200 players. I need to change the frequency of attacks and raids, which would mean I have to be on-line almost every day. In terms of defense, however, I have to totally revamp my Travian defensive strategy. Me, in addict-mode? The last time I looked at the Firefox statistics, it noted that I have visited Server 10 63,236 times, based on Firefox History of the login page being accessed starting June 2010. So, if a projection for the entire game is made, from Nov 2009 to Oct 2010, there is a possibility that I have visited Server 10 for only about 15,000 times! Moreover, maybe with the news flash announcing the opening of a Championship server, maybe it would have a place for me. Also, it would be a really great challenge for me if I could sustain all these. In the resource fields, after all Crop fields are on level-5, then created a level-1 Grain Mill, prioritized increasing the production of Iron, Lumber, and Clay in that particular order, as three  Roman Settlers are notoriously Iron-hungry. It most of my Roman Villages, a certain building path is followed: level up the Main Building to 10, initially build the Warehouse and Granary to level 10, City Walls to level-10, four to eight level-10 Crannies, until the Residence reaches level 10. 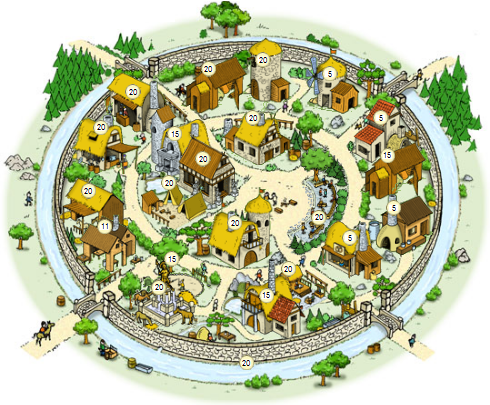 Incidentally, the location of each particular building in all Village Centers are fixed by ID number, e.g., Granary is usually assigned at id=21, Academy at id=25, Barracks at id=30 or Marketplace at id=36. Thus, switching from one Village to the next automatically shows the same building which, for me, makes upgrades and research virtually more easier. When sitting other accounts, I usually felt at a loss when buildings are somewhat randomly created anywhere on the Village Center. As a sitter, I am often annoyed when I find out that the Barracks and Marketplace are placed side by side. In the Standard Graphic Pack of Travian, the image used for these two buildings are almost identical, except the color of the roof! After the three  Settlers are on their way to settling a nearby Village, level up the Hero’s Mansion to 10 ONLY if there are available oases for conquering. Else, speed-up increasing the Academy to level 10 to build the Workshop. Incidentally, Blacksmith is prioritized to level 3 to build the Stable after the Academy reached level-5. Build the Armoury to research the Praetorians; then once research is completed, create Praetorians as many as possible. With Villages spread apart, the building of the Academy in each of the far-away sector proved essential because in the event when one Village is conquered, the other Villages could still continue research for additional troops in its respective Academy. Building only one Academy for the entire realm is applicable IF and ONLY IF all Villages are three  minutes away from, or adjacent to, each other. Thanks, randomgeek! Hope I could try my luck in x2!